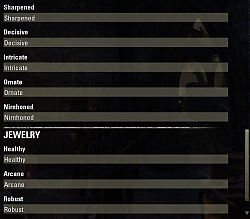 Replaces any weapon, armor or jewelry trait text with custom text you specify in settings. Be creative and express the full measure of your frustration with that effing Invigorating trait! 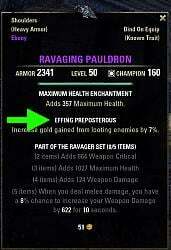 Edit: I know that ever since Morrowind, the trait has been called Invigorating, not Prosperous, but the recovery bonus is so small, it's still preposterously bad. I'm not changing the addon name. 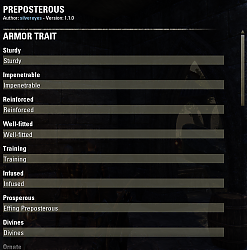 The custom text supports color formatting as well, if you want to get fancy and color code your traits. 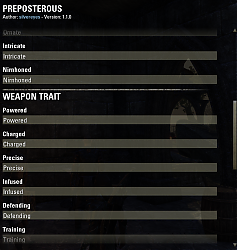 - Update 20 Murkmire compatibility. 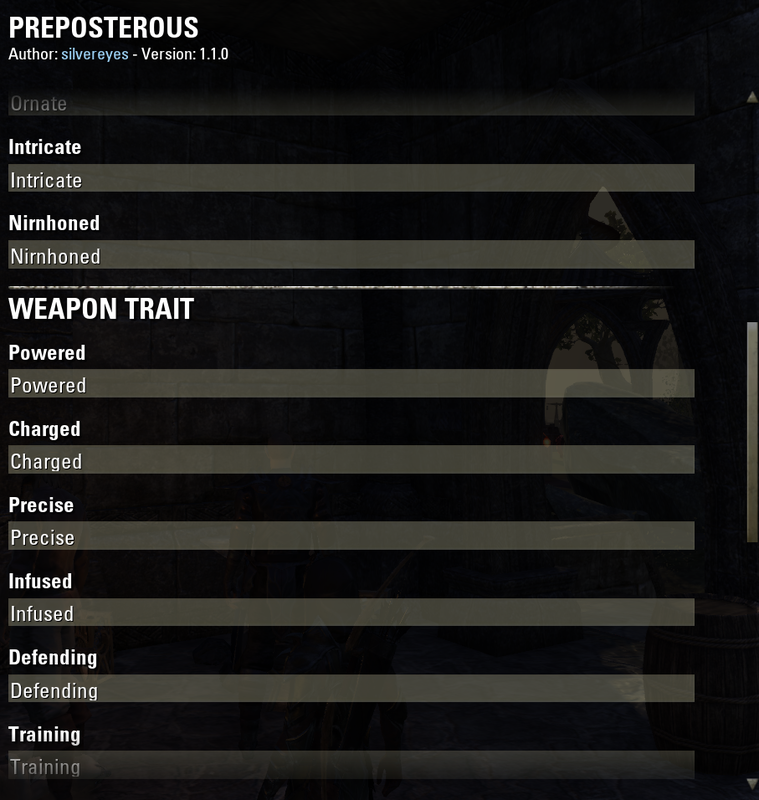 This version is compatible with both Murkmire PTS and Wolfhunter live. - Support for account-wide and server/world-specific settings. - Added support for the "No Trait" text. Not normally displayed, except in addons, but why not? 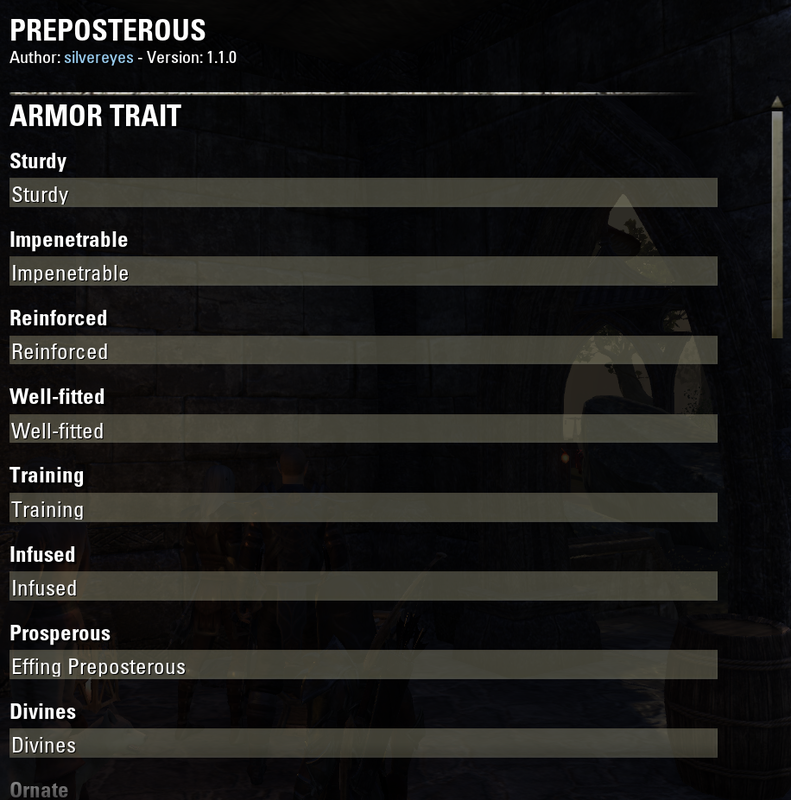 - Preliminary support for Lazy Writ Crafter master writs feature. Still working out the kinks. Any suggestions for quick fixes via lua code editing is appreciated! Many thanks for the speedy response! Last edited by silvereyes : 10/22/18 at 09:32 PM. Tried a complete uninstall (including Saved Variables) & reinstall with game NOT running; Issue persists. Thanks! Looks very nice compared to the regular plain white. Last edited by Martan : 03/05/17 at 02:44 AM. oooh! Can I claim the inspiration credit for this? Randactyl | NA Megaserver | Blood for the Pact! Check out my GitHub repos to follow my latest changes and see some addons before they are released. Can the same thing be done with an item's actual name? Not in the way this addon is implemented. Trait names are system wide global strings in the client UI, so they are easy to replace. 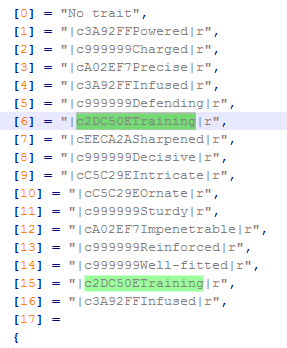 Item names come from the server in deeply-integrated API methods. It may be possible to do what you are suggesting, but without digging any deeper, it sounds like a can of worms. Customizing other trait names, however, is a feature coming to this addon. Soon(tm). Interesting idea though. Can the same thing be done with an item's actual name? 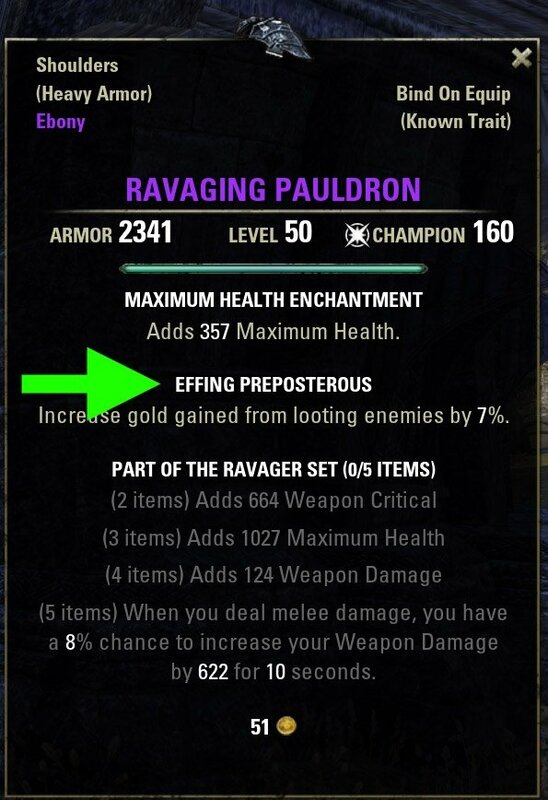 For example, could you rename that "Ravaging Pauldron" to "DPS Shoulder" in the same way you rename Prosperous to "Effing Preposterous"? 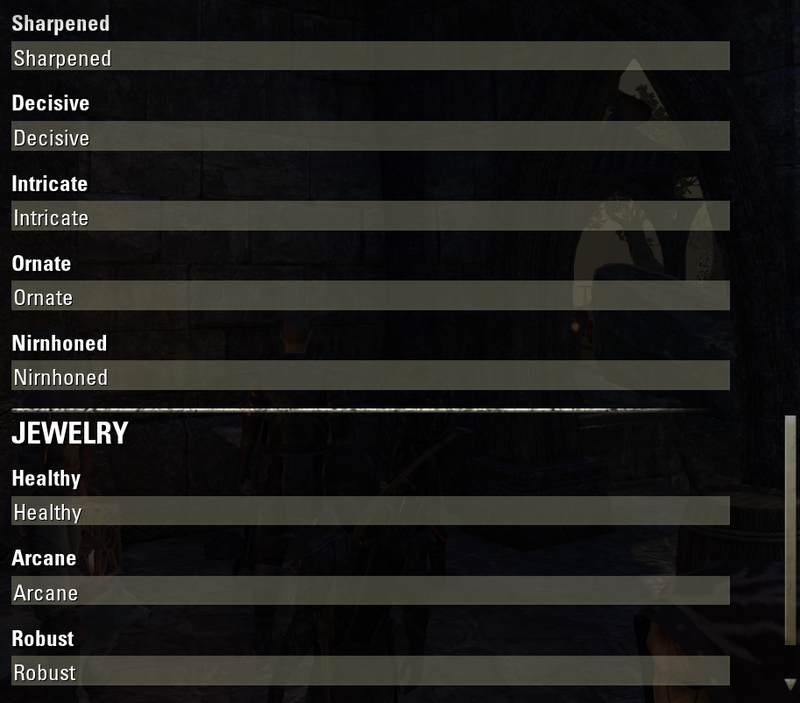 I'm wondering if this addon's functionality could be applied to create a better inventory system so we can name our items and sort them that way, or just for being creative for RPers. 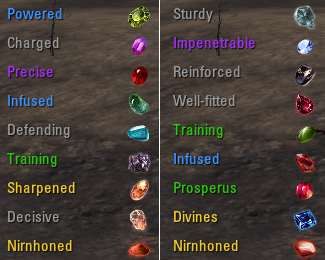 edit: Quality Sort, Postmaster, and Craft Bag Extended are some of the most complete and well-executed addons I've seen. Great work silvereyes! Last edited by OSean980 : 03/03/17 at 05:23 PM.